Do you think you would find really good sushi in the land of Polish pierogies? Well, yes, you can find good sushi in Warsaw! And last week, I even learned how to make sushi from a Japanese master sushi chef! If you love Japanese food and haven't taken a sushi-making class, then you are missing out. 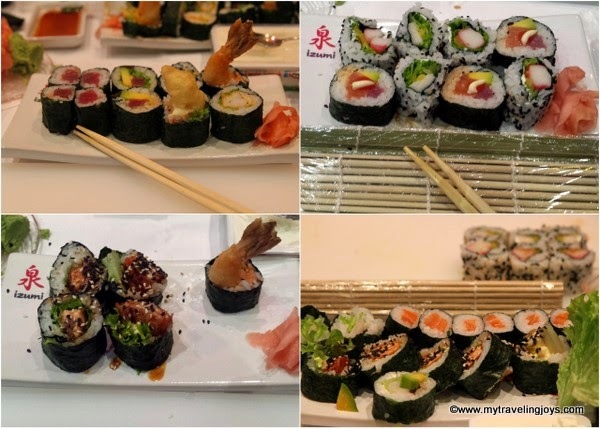 Thanks to my girlfriends through the International Women’s Group of Warsaw, they organized a special sushi-making class with the chef/owner of Izumi Sushi, Alon Thon. Thon and his Polish wife, Alicja, own three sushi restaurants in Warsaw, and she writes a blog called FoodFashion. He recently competed in the World Sushi Cup in Japan as well. Chef Alon Thon spent seven years working and learning how to make sushi in Tokoyo. He told us that he got lucky and started learning how to prepare sushi right away instead of washing the dishes for two years, a job many apprentices usually do. 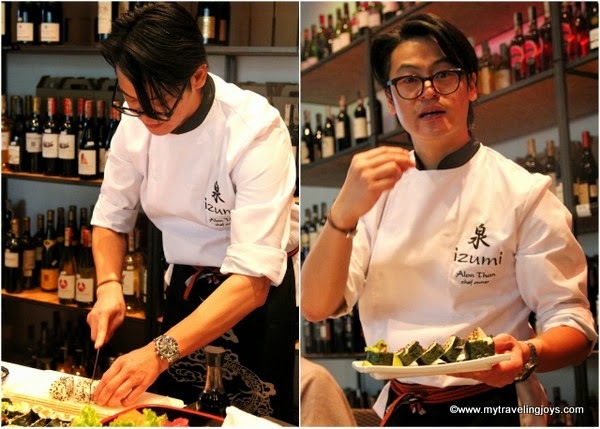 In 2003, he moved to Poland, and in 2006, the couple opened their first restaurant. In 2009, they opened the largest sushi restaurant in Poland called Izumi Sushi Biały Kamień located in the Mokotow neighborhood. Imagine being surrounded by lush vines, tropical plants and 100-year-old palm trees, learning how to make sushi from an expert and chatting with friends. This was the perfect activity to beat the winter blues! The Biały Kamień restaurant is located in a pre-World War II orangery/greenhouse and feels like you are almost in a jungle. I had no idea this place existed, but I’ll definitely be returning…soon! Chef Alon Thon told us to lay down the nori first and then lightly press the sushi rice on top of the nori in order to make the maki-sushi (the normal rolls). Then, we could choose from either butterfish, crab, tuna or salmon and then add lettuce, avocado, shitake mushrooms and other pickled vegetables. However, you can’t add too many ingredients or the rolls are more difficult to roll. Rolling the sushi was the most difficult thing at first, but I got the hang of it after making a few maki rolls. Chef Alon Thon was very patient with us and is obviously very passionate about sushi. Look at all the sushi I made! I was impressed with the quality of fish we used. Thon told us he gets special fish deliveries flown in every week. I don’t cook fish very often because I don’t like cod or carp, which are the main fishes you’ll find here. Salmon is the safer option. We also learned to make sushi rolls with tempura shrimp and baked salmon topped with a teriyaki sauce. Lastly, we learned how to make uramkai-sushi, which is the inside-out style where the rice is on the outside and sprinkled with sesame seeds and the nori is on the inside with the other ingredients. I think this was the trickier one to roll up. 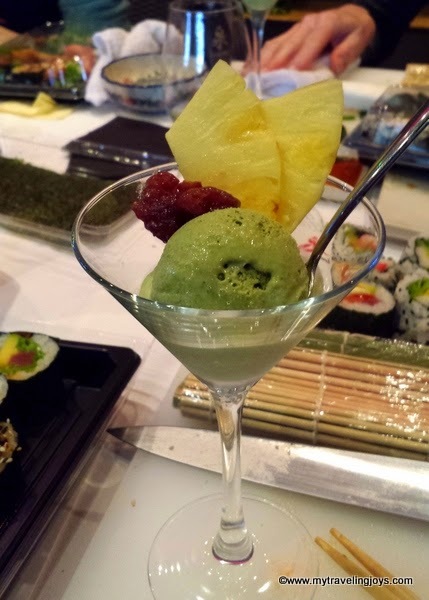 We ended our sushi-making class with a glass of delicious homemade green tea ice cream accompanied with hot green tea. What a treat! Luckily, I brought my extra sushi home so hubby got to try as well. Now, he has high expectations that he’ll be getting sushi at home on a regular basis. Hah! The group of us learning how to make sushi in Warsaw. Note: Izumi Sushi also coordinates children’s birthday parties as well as the sushi-making classes. Looks like a great time. I took a sushi making class a couple of years ago. It was a lot of fun. i love making sushi! i was just thinking the other day that i haven't made it in a while. I'd love to have a go at this. Did they freeze the fish first if using raw? All the fish tasted fresh, so honestly, I don't know.